Do high speed treadmills increase speed. Get the latest resource on the effectiveness of high speed treadmill training in producing more speed in your sprinters. Improvements in sprinting speed have been manipulated through the use of various techniques and unique instruments over many decades. The high speed treadmill (HST) has been one of those unique instruments that although highly effective, has come under much scrutiny. Early Russian research supported the benefits of inclined and over speed applications for the enhancement of sprint performance through the use of towing, most commonly applied using a motorcycle or automobile to tow the individual. The high speed motorized treadmill was developed to bring both of these applications together through 3 specific factors – safety, optimal teaching environment and accurate quantification of the training. Using this approach, the coach is able to teach mechanics and body position at specific velocities, inclinations and time, to progressively enhance ability and performance, and more importantly, within a safe environment. If one can properly manipulate strength, speed, and power, within the mechanics of the activity, improvements or adaptations will occur. 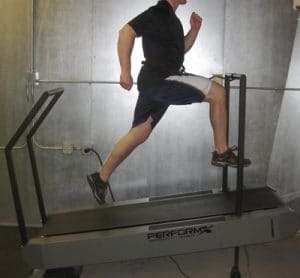 If this activity is straight line sprinting speed, these applications through the use of a high speed treadmill, are no different than using traditional lifting techniques like the back squat or power clean, to enhance lower extremity strength and power. Inevitably, the motion of sprinting will be done on the ground, but arguments can be made in favor of utilizing HST for speed enhancement through specificity and stimuli occurring through inclination and velocity. Hauschildt, M. D. (2010). Integrating high-speed treadmills into a traditional strength and conditioning program for speed and power sports. Strength & Conditioning Journal, 32(2), 21-32. Kram, R., Griffin, T. M., Donelan, J. M., & Chang, Y. H. (1998). Force treadmill for measuring vertical and horizontal ground reaction forces. Journal of Applied Physiology, 85(2), 764-769. Gottschall, J. S., & Kram, R. (2005). Ground reaction forces during downhill and uphill running. Journal of biomechanics, 38(3), 445-452.